The Ultimate Steroids is, as the original Steroids was, an Asteroids-clone. Basically, you jump to the cockpit of a space ship, and burst through the space shooting space rocks, asteroids. You collect some power up -bonuses and slowly increase your firepower. You will encounter some hazards during your mission such as evil aliens and strange black holes. The Ultimate Steroids is 100% freeware. 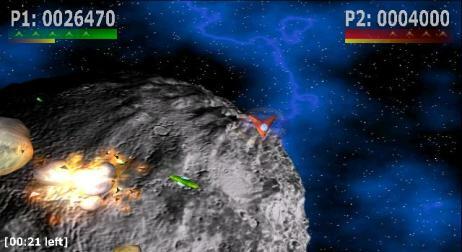 The game features OpenGL accelerated 3d graphics, sound and music, up to 10 weapon grades and up to 22 levels. Balanced gameplay with beautiful rendered backgrounds and colorful 3d graphics. There is also a support for two players, either in a co-operation or in a competition. In addition, the competition mode allows you to set various game play settings.